These stunning images showcase the incredible complexity of the human brain through an explosive fusion of art and science. 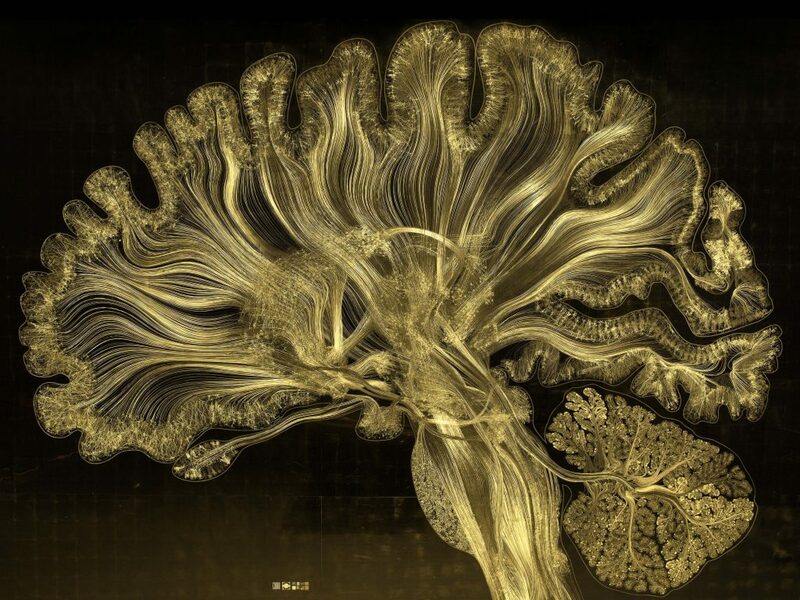 The most elaborate artistic visualization of the brain in the world, the work highlights what is happening inside the human brain while an individual is looking at such a masterpiece. Artists Dr. Greg Dunn and Dr. Brian Edwards hope this work – entitled Self Reflected because it is your brain perceiving itself – will increase appreciation for the brain’s complexity through the power of art. Image: GREG DUNN AND WILL DRINKER / CATERS. The entire Self Reflected microetching under white light. The work combines space and time because it is illuminated by a number of different lights that are constantly changing in color and brightness, so that the fine lines representing neural pathways seem to shimmer as they process thought. Further complexity is seen when the viewer moves around the piece, for the three-dimensionality of the etched surface reflect different colours depending on the viewer’s angle of perspective. While other disciplines often struggle to convey complex, multi-layered concepts, art is uniquely positioned to communicate ideas that are difficult, if not impossible to express otherwise. Self Reflected takes advantage of art’s power to use perception and emotion to implant a deeply nuanced idea and make direct connections about the brain of the viewer directly into the brain of the viewer.